Plan your trips for summer of 2016 by availing AirAsia Philippines’ one-centavo seat sale with promo seats up for grabs for domestic and international destinations. We've been to several places in the Philippines and nearby countries including Kota Kinabalu and Malaysia via Air Asia. Check on our blogs for sample itinerary, recommended hotels and restaurant to try. AirAsia Philippines, a member of the AirAsia Group that has been awarded the world’s best low cost airline for seven consecutive years by Skytrax, offers flights to/from Manila, Kalibo (Boracay), Cebu, Tagbilaran (Bohol), Puerto Princesa (Palawan), Davao and Tacloban with international flights to/from Hong Kong, Macau, Kuala Lumpur, Kota Kinabalu and Incheon (Seoul). The promotional all-in-fares are from as low as P16.81 inclusive of applicable taxes and fees for one way only. These promotional seats are available for booking at www.airasia.com from 7 to 13 September 2015, for the travel period from 1 March to 29 October 2016. 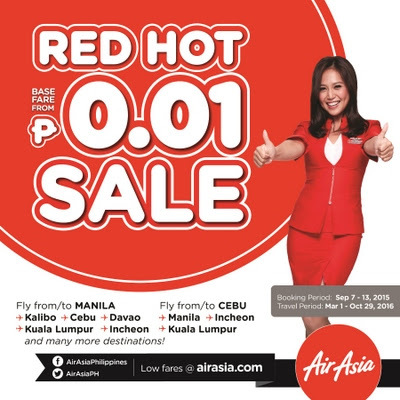 The one-centavo base fare promotion is available online at www.airasia.com and also via AirAsia’s mobile apps on iPhone and Android devices, and also AirAsia’s mobile site at mobile.airasia.com. Just search AirAsia on the respective app stores to download and start booking!